Last week, I ran a photo essay about Marvel Super Hero Island at Universal’s Island of Adventure. 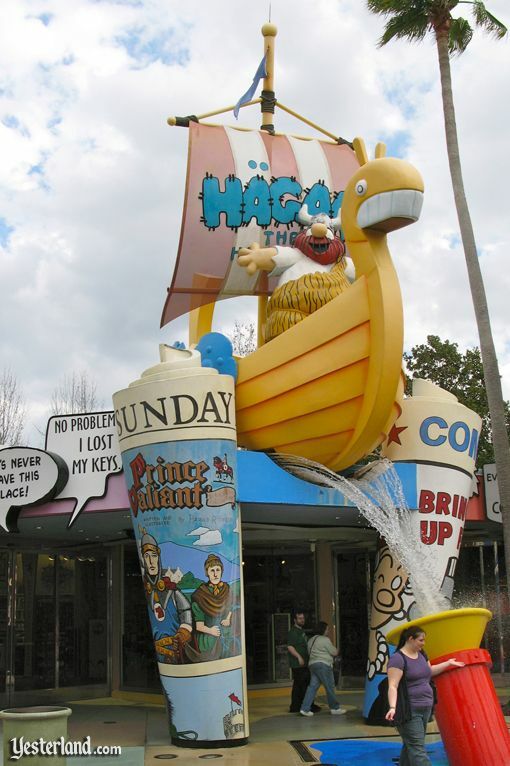 This week, we’re back at Islands of Adventure, only now the subject is Toon Lagoon. 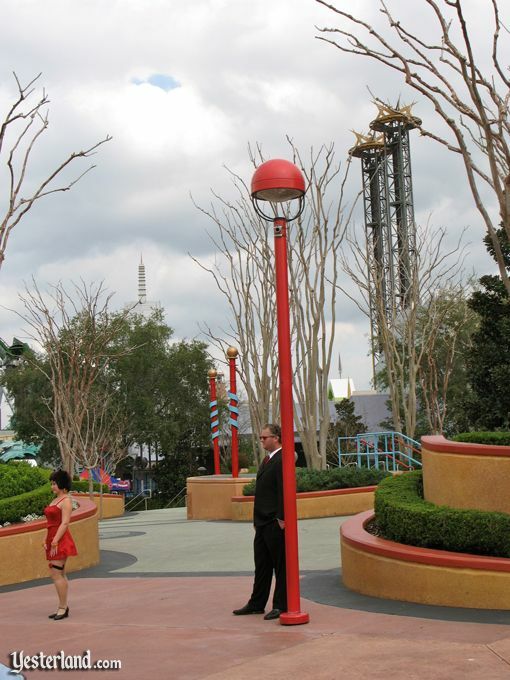 Once again, the “then” photos are from early 2000, when the new park was around eight months old, and the “now” photos show the same places 11 years later. The two photos above could be shuffled, and the only way you might remember which is older and which is newer is the disposable camera in 2000 took pictures that weren’t as sharp as those from the digital camera. What do Hägar the Horrible, Prince Valiant, Beetle Bailey, and the other characters at the heart of Toon Lagoon have in common? They’re all licensed by King Features, the comic syndication unit of Hearst Corporation. The bewildering array of unrelated (except by common corporate control) characters makes this part of Toon Lagoon the oddest place in Islands of Adventure. 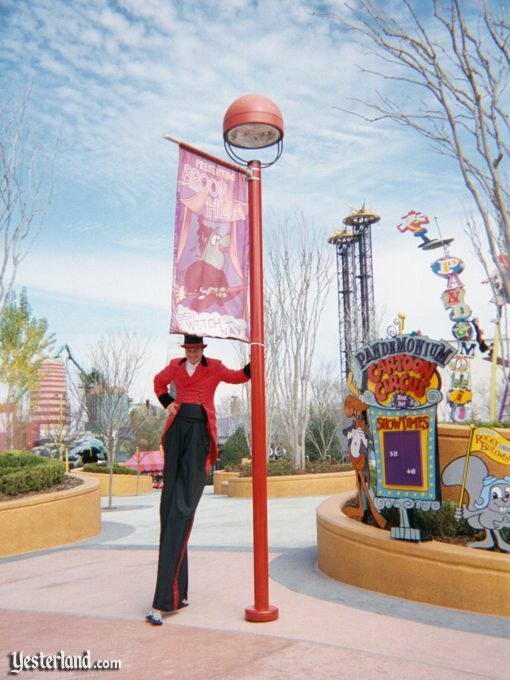 The buildings are decorated with giant photo-op characters and captions. Older guests might associate Universal with its own roster of animated characters—Walter Lantz’s Woody Woodpecker, Andy Panda, Chilly Willy, Wally Walrus, Buzz Buzzard, and even Oswald the Lucky Rabbit. But when Islands of Adventure was built, Woody and his friends already had a home next door at Universal Studios Florida. Also, Universal’s characters just don’t have the appeal and popularity of Walt Disney’s cartoon stars—notwithstanding that Oswald the Lucky Rabbit had originally been a Walt Disney character. In the first photo of the above pair, notice the sign for one of the park’s original attractions, the Pandemonium Cartoon Circus. Cartoon and comic strip characters performed a live circus show in a permanent 2,000-seat amphitheater. The show lasted less than a year. The scene in the second photo might look a bit creepy at first—until you realize that the woman in the red dress is Betty Boop, ready to greet guests, and the man behind her is part of that activity. The amphitheater is still there. It gets occasional use for television show tapings, concerts, temporary shows, and private events. With the amphithater seldom in use, its plaza comes across as a no man’s land between Toon Lagoon and Marvel Super Hero Island. The roof shingles on the entrance building are a different color in the two photos; and the bush along the right edge is bigger. But, overall, time has stood still in Sweet Haven. Popeye the Sailor by cartoonist Elzie Segar made his appearance as a comic strip character in 1929. Max Fleischer made Popeye an animated cartoon star in 1933. Since then, Popeye and his co-stars have enjoyed a long career in theatrical shorts, featurettes, and television. In 1980, Paramount Pictures and The Walt Disney Company collaborated on a live-action movie musical staring Robin Williams as Popeye. 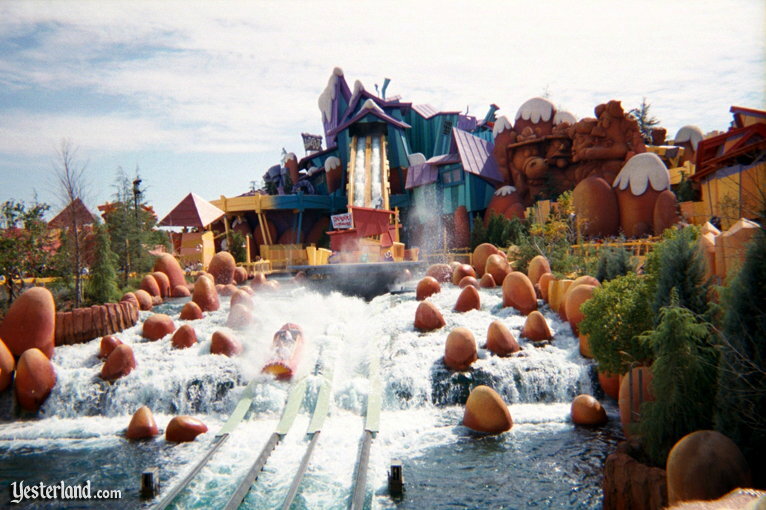 Dudley Do-Right’s Ripsaw Falls—starring the Royal Canadian Mountie himself, his girlfriend Nell Fenwick, his horse Horse, and his evil adversary Snidely Whiplash—is better known for absolutely drenching riders than for having clever, entertaining show scenes. 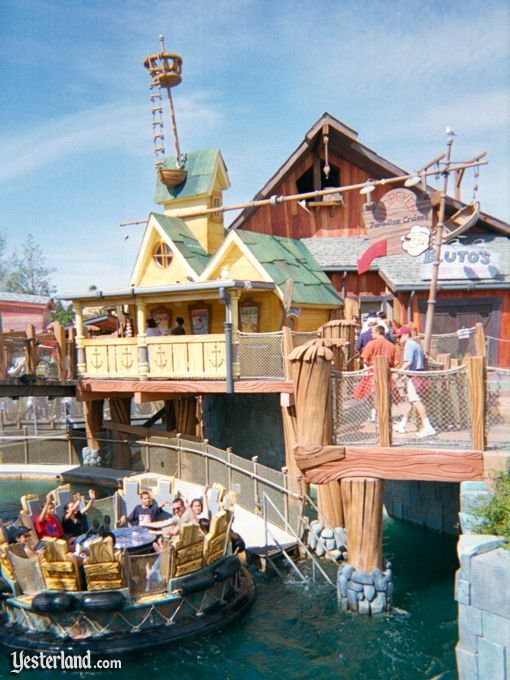 Universal could have filled the log ride with gag-filled scenes based on Jay Ward’s satirical cartoons from the 1960s. 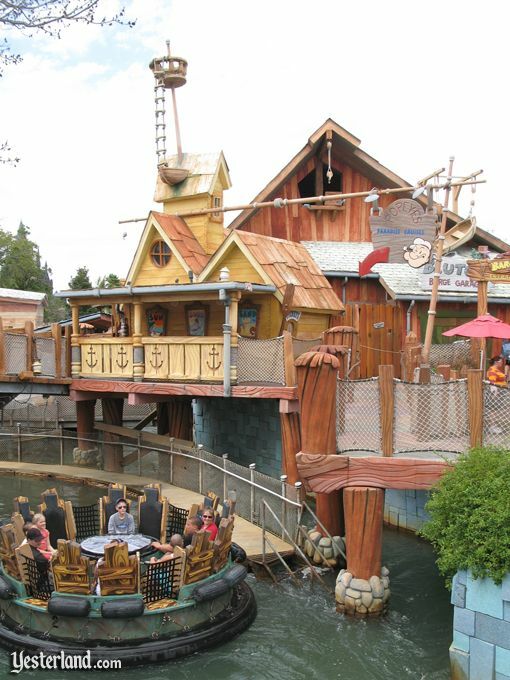 Instead, the emphasis is on the drops and on getting wet, while the show scenes are far less elaborate than those of Disney’s Splash Mountain. It was impossible to match the photo from 2000 because a pesky construction wall was in the way. 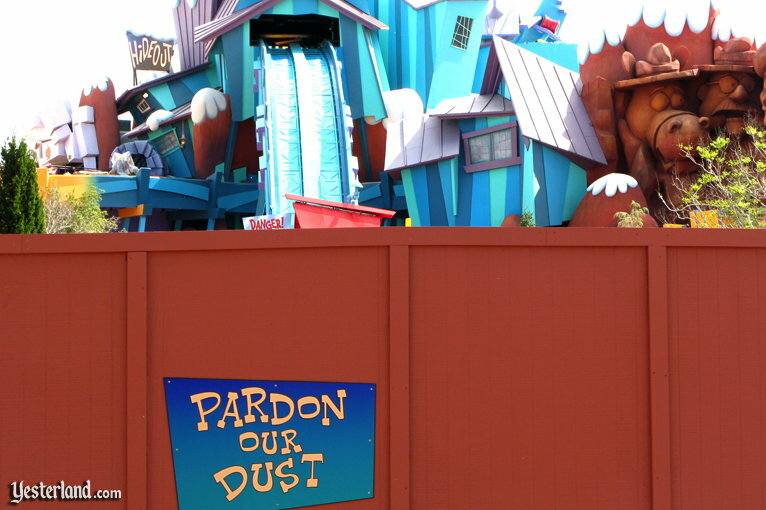 It was more than routine maintenance for Dudley Do-Right’s Ripsaw Falls. On the afternoon of New Years Day 2011, 40 firefighters responded to a two-alarm fire at the attraction, which had been operating when the fire began. All guests were safely evacuated. After two months of repair and maintenance, the attraction reopened March 3. 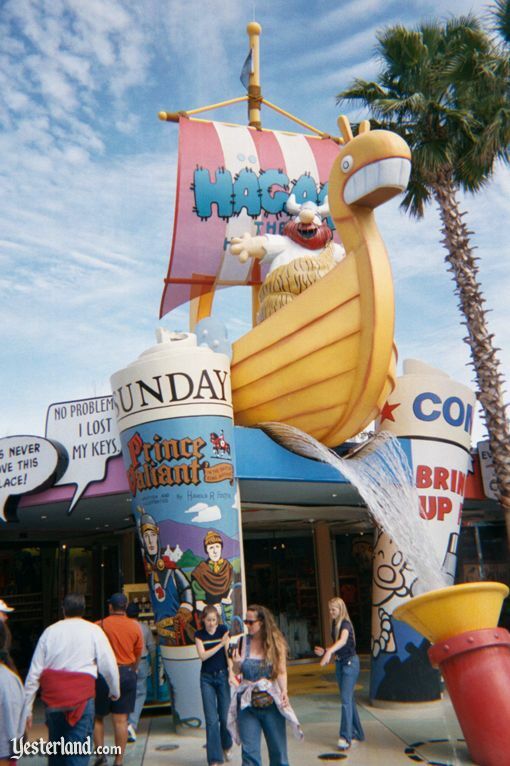 Toon Lagoon is an example of how little has changed in the original sections of Universal’s Islands of Adventure since the park opened in 1999. The Pandemonium Cartoon Circus closed. Of course, the retail selection and restaurant menus have evolved. But, overall, the attractions, structures, and decor of the land are essentially unchanged.